Hi there. I know I've been a bad blogger lately, but life happened. Sorry. Now that we have this covered, let's move along to the fun part of this post. This morning, as I was stuffing my suitcase for my summer vacation in my home island, a thought came to mind: I have lots of high-street or fast-fashion clothes in my closet. Maybe too much. And fast fashion is bad. However, I am also the proud owner of items by local and international non-fast-fashion labels, several second-hand and vintage items, as well as some designer stuff, both mainstream or independent. Surely it should be perfectly possible for me to get dressed for a whole month without utilizing any fast-fashion-produced items. So, half an hour before I was due to head to the airport, I emptied my half-made suitcase and started all over again, this time no fast-fashion-items whatsoever. A vacation is a perfect opportunity to try this experiment. During holidays we live out of a suitcase anyway, so a limited choice of options is the norm. As the idea for this experiment is relatively fresh, I haven't had the time nor the determination to list every single one of my suitcase's contents today, but I'm planning to do so in the following days. A necessary disclaimer here: I'm no expert in determining which label should be considered fast-fashion and which not. The choices I made for this experiment were purely subjective. 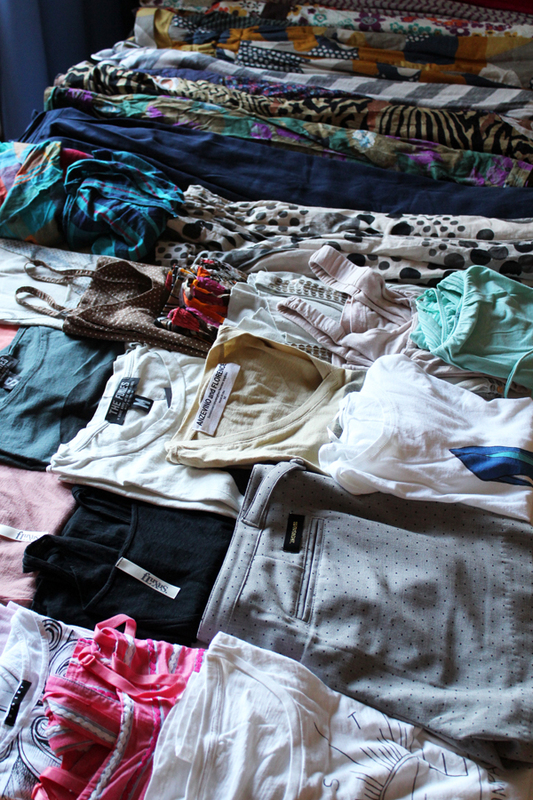 Specifically, I vetoed all items by Topshop, H&M, the Inditex family and several other similar brands. And let me tell ya, that was no easy task. Almost all my basic summer tank tops are by H&M and the majority of my skirts are ZARA. Not packing most of my tried-and-tested go-to basics for this vacation felt weird. But experiments are meant to be exiting and force us out of our comfort zone. Restricting given options is known to lead to more creativity. The image on the top of this post is the whole contents of my suitcase (minus shoes and accessories) just after I unpacked. I will try to post outfit pics each day, plus a complete index of all the items I have packed. eeem, sory for asking but...how many days are you planning to stay on island??? seems to me you've packed for a whole season! Lol and lol again I say. Hope you have lot's of fun and keep posting! Nice! I'll be interested to hear what happens! Oh I'm really excited about the outcome of this project, because outfits of the day are ok, but outfits of the day WITH rules are really intriguing! But what I haven't quite understood is what you define as fast fashion. Cheap clothes from mass production brands that we don't mind throwing away after a couple of seasons since we can easily replace them? Clothes quite trendy that we buy knowing we will only wear for a couple of months since later they will look out-of-date? But if so, a basic shirt in a a basic color from eg Zara that hasn't worn out through the seasons and we still wear it again and again, why should we consider it fast fashion? So I'm really forward to see how you're gonna address these issues! I had a project in mind myself, outfits with clothes older than 18 months, probably they're not gonna be fashion forward outfits, but can they be interesting ? I agree that these projects can be fun and creative, especially since nowadays everybody seems to fashion blog, so why not take it to another level. Let me know how difficult it will be to pull it off especially those practical details you can't avoid for example remembering to take a picture each day! !